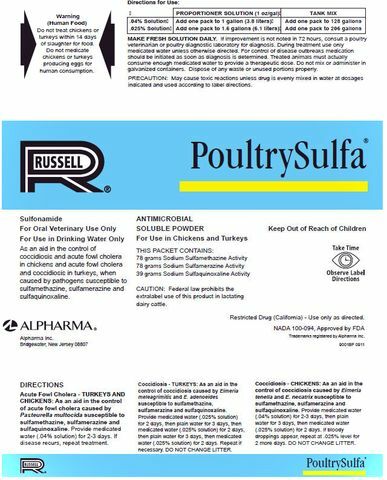 As an aid in the control of coccidiosis and acute fowl cholera in chickens and acute fowl cholera and coccidiosis in turkeys, when caused by pathogens susceptible to sulfamethazine, sulfamerazine and sulfaquinoxaline. Federal law prohibits the extralabel use of this product in lactating dairy cattle. Do not treat chickens or turkeys within 14 days of slaughter for food. Do not medicate chickens or turkeys producing eggs for human consumption. MAKE FRESH SOLUTION DAILY. If improvement is not noted in 72 hours, consult a poultry veterinarian or poultry diagnostic laboratory for diagnosis. During treatment use only medicated water unless otherwise directed. For control of disease outbreaks medication should be initiated as soon as diagnosis is determined. Treated animals must actually consume enough medicated water to provide a therapeutic dose. Do not mix or administer in galvanized containers. Dispose of any waste or unused portions properly. May cause toxic reactions unless drug is evenly mixed in water at dosages indicated and used according to label directions. As an aid in the control of acute fowl cholera caused by Pasteurella multocida susceptible to sulfamethazine, sulfamerazine and sulfaquinoxaline. Provide medicated water (.04% solution) for 2-3 days. If disease recurs, repeat treatment. 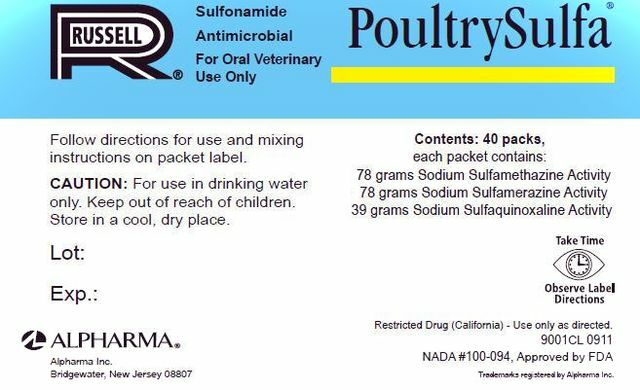 As an aid in the control of coccidiosis caused by Eimeria meleagrimitis and E. adenoeides susceptible to sulfamethazine, sulfamerazine and sulfaquinoxaline. Provide medicated water (.025% solution) for 2 days, then plain water for 3 days, then medicated water (.025% solution) for 2 days, then plain water for 3 days, then medicated water (.025% solution) for 2 days. Repeat if necessary. DO NOT CHANGE LITTER. As an aid in the control of coccidiosis caused by Eimeria tenella and E. necatrix susceptible to sulfamethazine, sulfamerazine and sulfaquinoxaline. Provide medicated water (.04% solution) for 2-3 days, then plain water for 3 days, then medicated water (.025% solution) for 2 days. If bloody droppings appear, repeat at .025% level for 2 more days. DO NOT CHANGE LITTER. Trademarks registered by Alpharma Inc.
only. Keep out of reach of children.